You demanded the best. We gave it to you. The Cargo Max™ XRT’s rugged technology combines strength, functionality and style. There’s simply no competition. Trailer body withstands full swings with a sledge hammer at -20°F with no damage! LEVEL RAMP MODE: For ATV’s and other high clearance loads. LIMITED TILT MODE: For low clearance vehicles, such as lawn mowers and motorcycles. FULL TILT DUMP MODE: For dirt, mulch, gravel and other loose material. 8' - 56", 9.5' - 73", 11' - 73", and 13' - 73"
FLOE has been building aluminum trailers longer than most other aluminum trailer manufacturers in the market today. At FLOE you will find an avid team of die-hard riders. We trailer, we ride, we test, we listen, and then we brainstorm! While this doesn’t sound like rocket science, it is key in providing you with quality trailers loaded with the features you want most. 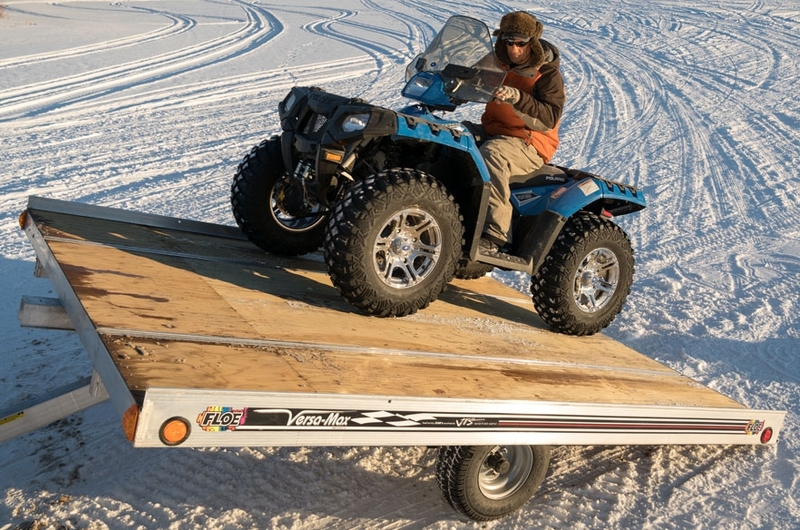 Versa-Max™ Tilt Trailers are the easiest trailer to load and unload. Just remove the clamp, tilt the bed and away you go! 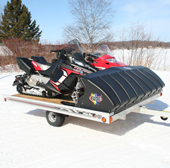 The tilt-style snowmobile/recreational trailer is the most popular model for one-or two-place trailers. This system is easier to use because it eliminates the hitch pin. It pulls the tongue tight to the trailer with a stainless steel bolt which eliminates the normal vibration common to inferior tilt trailers. FLOE Versa-Max™ tilt trailers are available in 10′ and 12′ models. They offer great value and excellent performance for pulling any type of load. Drive Off V-Front Ramps. The FLOE Ramp/Salt Shield makes it the easiest drive-on/drive off trailer available. The longer tongue on a Versa-Max™ Ramp trailer allows enough space between your trailer and the tow vehicle to lower both sides of the ramp/shield combo at the same time without jackknifing the trailer. Vortex Hubs are standard on all Versa-Max™ trailers. Vortex lubrication with a threaded grease cap makes changing or adding grease easy…no need to remove the hub! 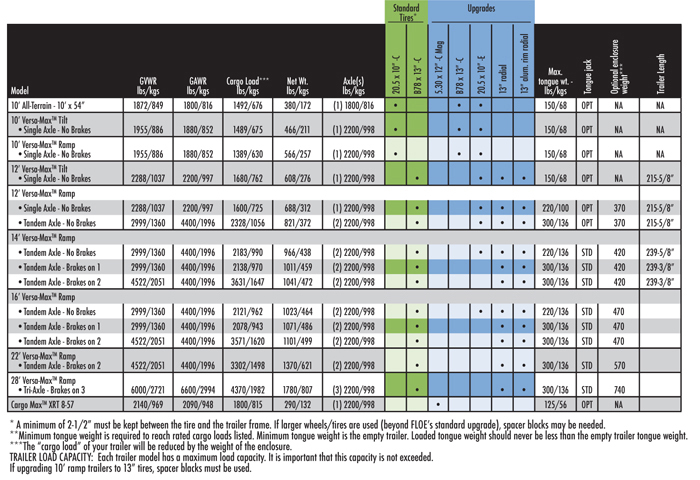 These features allow the manufacturer to offer a 6 year, 100,000 mile limited warranty. The Vortex hub/spindle is designed to be a no maintenance hub for 6 years. Versa-Max™ trailers are constructed with tubular extrusions adding rigidity and strength without the weight. These tubes eliminate the twisting and flexing issues found on “I” beam and “C” channel designs. 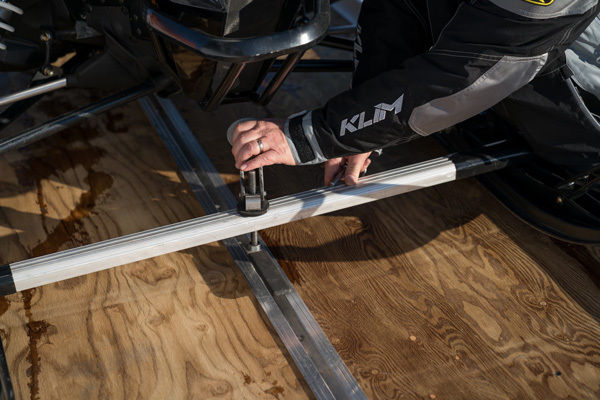 FLOE’s frame will lead to longer-lasting welds and ultimately a longer-lasting trailer. The enclosed trailer that tows so easily you’ll think it’s an open bed trailer! The Pro-Tektor™ trailer features front and rear access doors to provide easy, safe loading and unloading. The doors are mounted with FLOE’s exclusive, continuous extruded hinge design and feature two gas shocks to make opening and closing smooth and easy. Style…Function…Protection. The Pro-Tektor™ has it all! The aerodynamic front and rear gull wing doors are standard on all Pro-Tektor™ trailers, providing a high overhead clearance. Dual gas shock assist allows for easy access and a full-length hinge gives lasting quality and protection. Lockable Doors, Rock Guards, Enclosure Vents, Side Access Door, and an Optional Spare Tier Carrier. Pro-Tektor™ trailers also feature a limited 10 year warranty on the aluminum structure. The 54″ interior height accommodates a large variety of equipment, and a variety of length options are available including 12′, 14′, 16′, 22′ and 28′ sizes.